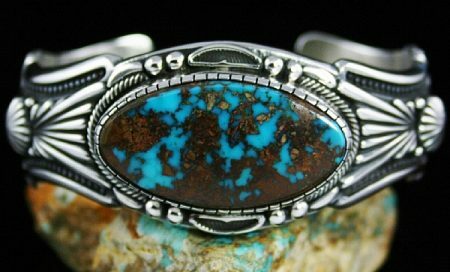 Harry H. Begay began his jewelry making career in the early 1970s. 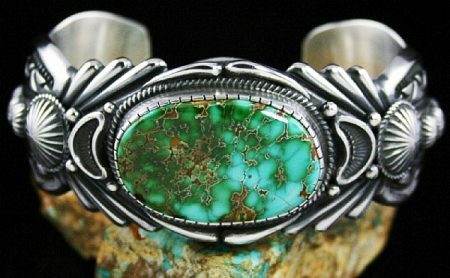 He is widely recognized as reviving traditional Native American silver smithing by building a piece of jewelry out of ingot sterling silver. He heats the ingot and anneals it prior to hammering out the desired shape. He then pulls the wire to be used in the piece through an iron block with different sized holes to create different gauges. Harry’s work is significant in that the resulting piece is so thick and heavy that it could not have been purchased from sheet and wire at a commercial supply store. This process is so labor intensive that it takes many times longer to create a piece. 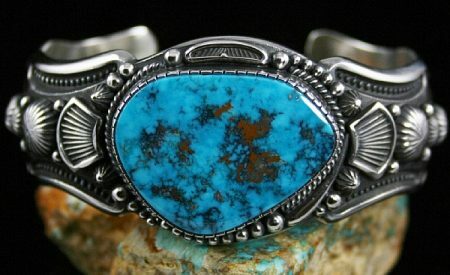 It is for this reason that he only uses the finest turquoise on the market. This includes the classic mines from Nevada, including Lone Mountain, Pilot Mountain, Red Mountain, Royston, Candelaria, Carico Lake and Godber Burnham. Harry’s contribution is so significant that he ranks as one of the most collectible Navajo silversmiths of the twentieth century. With over forty years of fine jewelry making behind him, we are proud to carry his work in the twilight of his career. 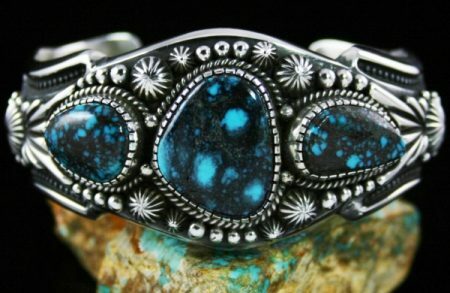 Navajo jeweler Harry H. Begay has created one of the finest bracelets of his career with this magnificent one of a kind piece. Deep Bisbee blue spiderweb from the Lavender pit is the rarest and most beautiful from this famed mine in southern Arizona. Three outstanding gems sit in the center of this piece matched to perfection. They are set in hand chiseled bezels encircled with hand twisted wire and droplets that taper up and down in size. The shank is made from labor intensive heavy hand rolled and hammered ingot sterling silver. Deep stamping is displayed next to finely chiseled stars and overlaid flairs on either side. The finished bracelet is a masterpiece, one of Harry's best and hence extraordinary and collectible. This exceptional bracelet by a master silversmith in the tradition of the early pioneer Navajos is made entirely by hand. The heavy shank is rolled and hammered out of ingot sterling silver. The shape of the shank is cut out using primitive tools. The scallops, buttons and flairs are each filed and deeply stamped. The bezel is hand chiseled and the shank is pounded on an anvil to its perfect shape. 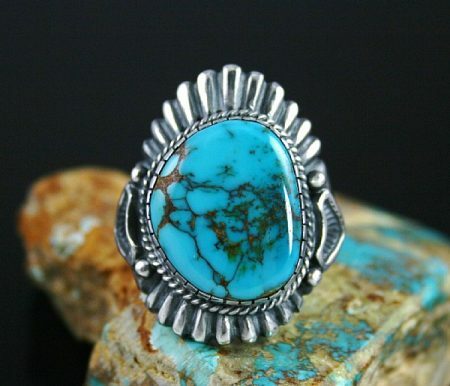 An exquisite gem grade natural Pilot Mountain turquoise is set in the center of the piece. The rare eye-dazzling gem is blue green with complex golden spiderweb matrix. The finished product is comfortable on the wrist collectible to own and beautiful to admire. It's hard to over emphasize the magnificence of the gem Harry has chosen to set in this fine sterling silver ingot bracelet. The natural cabochon is deep electric Morenci blue, with fine spots of iron pyrite and reddish host rock matrix. This is the highest grade found at this depleted mine and is highly collectible. It is set in a heavy rolled ingot shank, deeply stamped on the sides with finely chiseled stars up each side. Above the stars sit overlaid shields below the high chiseled hand made bezel. This is clearly one of his finest pieces. Navajo ingot artist Harry H. Begay has created this stunning ring out of thick hand rolled and hammered ingot sterling silver. The heavy shank of the ring exhibits deeply stamped overlay patterns and droplets on either side as well as a gorgeous ridge effect above and below. The elegant lines radiate out from the underside of the chiseled bezel encircling the stone. He has selected a large rare gem grade natural Kingman spiderweb turquoise cabochon to feature in the ring. The stone is a vibrant sky blue with complex black webbing and is encircled with hand twisted wire. 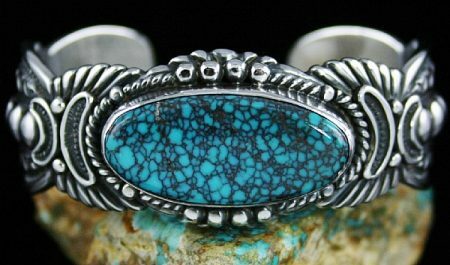 This exceptional Harry H. Begay bracelet is created out of extra heavy hand rolled ingot sterling with a shank that surpasses any gauge that can be commercially fabricated. The bracelet shank is then cut out to create the shape. Stars are chiseled and placed down the middle of each side. Above the stars are complex flutes pulled from ingot and overlaid on the top. 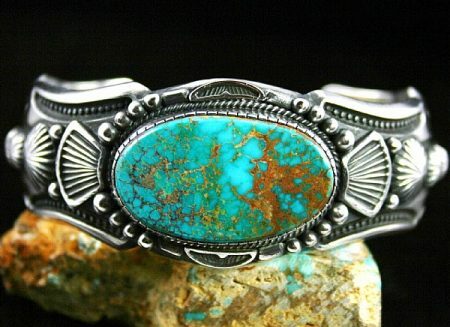 Above the flutes sits a high bezel chiseled to hold a magnificent large gem grade natural Pilot Mountain turquoise. The gem is bright blue with electric reddish brown host rock matrix and multiple layers of depth signature to the mine. This outstanding bracelet is created by rolling the shank out of extra heavy ingot sterling silver and cutting out the sides to create the shape. The design is formed by heavy stamping and filing on the sides and overlaying sterling rounds down the middle. Above and below the rounds Harry deeply stamps and flutes the edges on either side of the high hand chiseled bezel encircling the stone. Heavy twist wire and droplets are the final touch complimenting the quality and rarity of the cabochon. A marvelous gem grade natural Godber Burnham turquoise sits atop the bracelet shank. The gem is deep blue with complex spiderweb host rock matrix representing the finest quality from the mine. 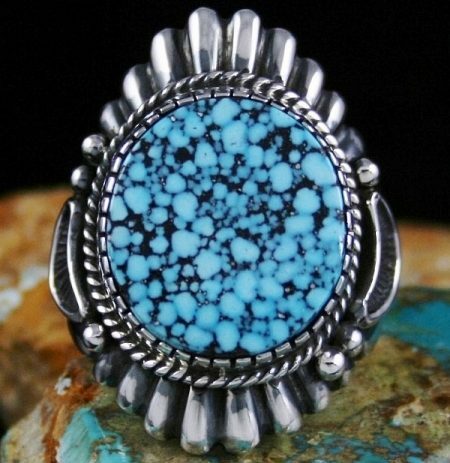 This fine ring created by Navajo jeweler, Harry H. Begay, features a bright sky blue gem grade natural Kingman turquoise with complex dark black spiderweb matrix. The gem is set in a high hand made bezel with a chiseled edge. 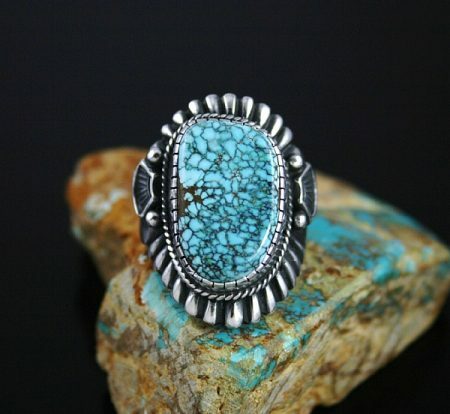 The bezel is surrounded by heavy thick twist wire, droplets and overlay patterns that sit on a rolled and hammered shank unique to the jeweler. The shank is made from labor intensive ingot sterling silver. The design is signature to Harry, with heavy fluted ends that sit perfectly on the finger. Navajo master ingot artist Harry H. Begay has created one of the signature masterpieces of his long career. He has chosen a rare gem grade natural Pilot Mountain spiderweb turquoise to set in his hand rolled and hammered bracelet. The gem has a blue green background with fine reddish and golden-brown spiderweb matrix. Harry has rolled the shank out of heavy ten gauge sterling silver and cut out the design. The shank is then deeply stamped prior to his creation of precise stars and droplets overlaid the length of the shank. The result is an incredible one of a kind piece created by the great innovator who revived the lost art of hand rolled and annealed ingot silversmithing. 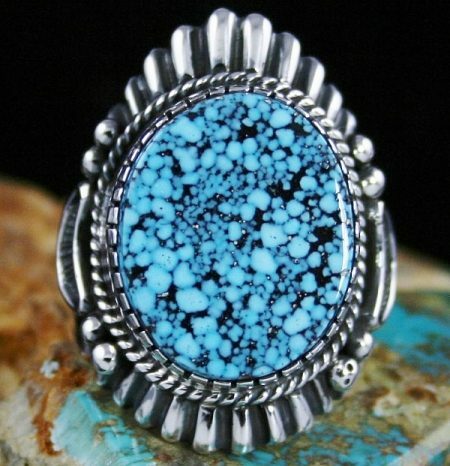 Navajo master jeweler Harry H. Begay has created this magnificent ring out of extra heavy hand rolled and hammered sterling silver ingot. The shank is deeply incised on each end and stamped in his signature style. He has chosen a rare and seldom seen gem grade Godber Burnham turquoise to set in a hand chiseled bezel. The gem is an incredible deep blue with dark reddish-brown matrix. The ring is easily one of the finest of his distinguished career. Master Navajo jeweler Harry H. Begay has created this magnificent heavy gauge ring out of hand rolled and hammered sterling silver ingot. The upper and lower portions of the ring face are raised in an incredible sunburst design with deep stampwork and smooth droplets on either side of the shank. 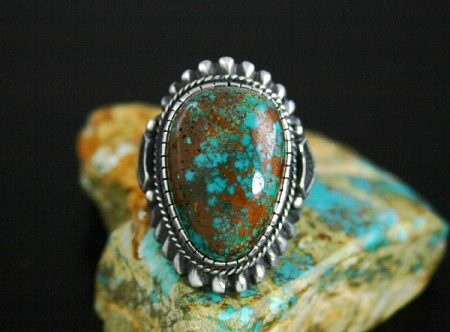 Harry has selected an incredible rare gem grade natural Pilot Mountain turquoise to set in the piece. Surrounded by a hand chiseled bezel the gem exhibits a high dome with fine reddish-brown spiderweb matrix set against an outstanding dark blue-green background. Award winning Navajo artist Harry H. Begay performed with skill and precision creating this magnificent one of a kind ingot ring. The piece features an amazing rare high grade natural Number Eight spiderweb turquoise cabochon with tight dark chocolate and golden-brown webbing. The gem is set in heavy gauge hand rolled and hammered ingot sterling silver with a high chiseled bezel surrounded by braided wire. The upper and lower portions of the ring face are raised in an incredible sunburst design with deep stampwork and smooth droplets on either side of the shank. 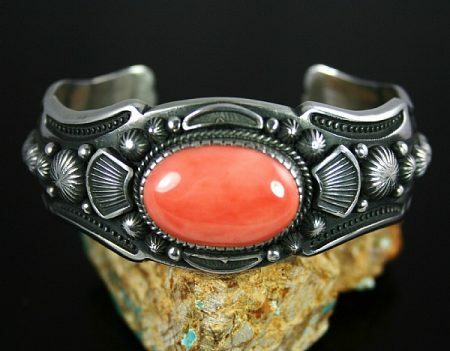 Award winning master Navajo artist, Harry H. Begay, has created an incredible hand rolled and hammered ingot bracelet set with a large rare gem grade natural Mediterranean angel skinned coral. The cabochon is set in a hand made chiseled bezel surrounded by stamped stars and droplets as well as four overlayed fan designs. The shank is extra heavy gauge and deeply stamped with dark oxidation. Large beaded and overlayed stamped stars flow down the center of the shank to the terminals on either side with crescent-shaped patterns on the outer edges. Large flawless coral is rare and valuable on today's market making this piece even more collectible.